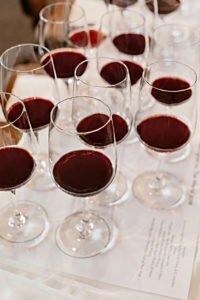 Don’t Miss The Super Bowl of Wine Events - Taste Washington - Write for Wine: It's Wine O'Clock Somewhere!Write for Wine: It's Wine O'Clock Somewhere! Run, don’t walk, to get your tickets to the 21st annual Taste Washington, which we call “the Super Bowl of Wine Events” because it is the country’s largest single-region wine and food extravaganza. You don’t want to miss this explosion of tastes, fun and education on March 22-25 in Seattle. This year, Taste Washington features more than 225 wineries, 65 restaurants and some of the nation’s top chefs. This four-day experience is packed with diverse activities, and different pass options: in addition to individual tickets, The Connoisseur pass guarantees VIP access to all of the festival’s signature events; The Enthusiast pass offers VIP access to The New Vintage and both days of the Grand Tasting. The Grand Tasting ticket includes access to the Alaska Mileage Plan Chef’s Stage, which features live cooking demonstrations. This year’s demo chefs include Departure Restaurant + Lounge’s chef Gregory Gourdet, Tin Roof’s chef Sheldon Simeon, Hudson House’s co-chef Brooke Williamson and Mixtili’s chefs Rico Torres and Diego Galicia. The VIP Red & White Party at AQUA by El Gaucho offers exclusive pours and exquisite bites on Thursday, March 22 on the Seattle waterfront. Twenty-one wineries will be pouring 91-point wines from their wine clubs. Guests are invited to arrive in style for this upscale evening in their best red-and-white attire. Taste Washington on the Farm on Friday, March 23 features a series of multiple, unique daytime excursions led by local chefs, farmers and Washington State winemakers. This year’s excursions out to the farms require travel by planes, ferries and cars. On Friday evening,The New Vintage event will feature celebrity chef tasting stations, more Washington State wines, and music at Fisher Pavilion at the Seattle Center Campus. Informative and fun wine seminars, which include tastings and interactive panels, will be held on Saturday, March 24 and Sunday, March 25 at the Four Seasons Seattle. The Taste & Savor Tour returns on Saturday, March 24, with tours being offered at 8 am and 9 am, when you can enjoy exclusive access to Pike Place Market. 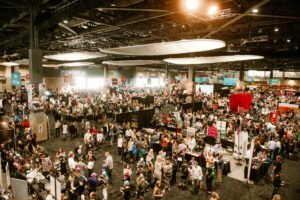 The Grand Tasting at CenturyLink Field Event Center will be held on both Saturday and Sunday, with more than 225 Washington wineries and 65 restaurants. Before you enter the doors of the Grand Tasting, we highly recommend that you develop a plan. Because once there, you will be hit with a massive amount of taste potentials — and it can be overwhelming. So make a list of wineries and restaurants you want to make sure to visit. But always leave room for some flexibility; chances are something will catch your eye as you walk through the aisles. Of note, we recommend tasting and spitting wine (or pouring it into the buckets at each booth) at this major event, but if you think you might want more than a sip or two, many hotels in the area are offering special weekend packages. Otherwise, be sure to have a designated driver, or take cabs or local transit home. This entry was posted in Columbia Valley, Horse Heaven Hills, Lake Chelan Valley, Red Mountain, Walla Walla, Washington, Wine, Wine Events, Woodinville, Yakima Valley and tagged Taste Washington, Visit Seattle, Washington wine, Washington Wine Commission, Washington wineries, wine, wineries by Margot. Bookmark the permalink.